128GB iPad mini 4 (Wi-Fi Only, Silver) is rated 4.8 out of 5 by 85. Rated 5 out of 5 by Anonymous from Awesome IPad Mini 4 Love it! I love to play games on Facebook. I also like to store and read books on the IPad. There are lots of sites to download free and interesting books. In addition, when I travel I love carrying this with me instead of lugging around a laptop. I can easily check my email, and do anything I can do on my laptop or my regular computer on this Mimi IPad. I am using my mini IPag to write this review. I may never use my laptop or regular computer again. Screen resolution is fantastic. Processor is powerful and quick. B & H Photo had the best price with fast and free delivery. I received it in three days. I do wish there was a place to plug in earphones, but there is not. I was also disappointed that the charging cable supplied is only three feet long. But that can be easily remedied by buying a longer one. 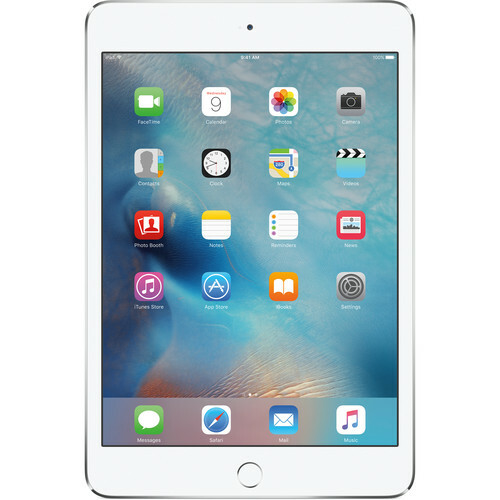 Rated 5 out of 5 by MightyTiki from Great Tablet It took awhile to decide to buy the iPad Air 2 or the iPad Mini 4. Coming from the iPad 2 (2010), any newer device would be a huge improvement in performance. For me, I primarily use my old tablet for consumption: watching videos, playing games, looking up information and for general entertainment purposes. Furthermore, I would be primarily using it at home or when commuting or traveling, so having a smaller form factor and being lighter is a major plus. If you use your tablet for work or productivity (writing emails, typing up reports, etc. ), getting the iPad Air 2 makes sense. The iPad Mini 4 is a wonderful product, even without the 3D touch feature or newer features on the iPhone 6S/6S Plus. Rated 5 out of 5 by Mrbutler52 from Great ipad B&h had the best price for the what I wanted. I new I wanted an iPad mini because I loved my iPad mini 2. The only thing I didn't like about it was 32 GB just wasn't enough space. After doing some research I decided that I should go big with 128 GB. I looked at the mini 3 and found some great deals but then I did some research. The mini 3 was basically the mini 2 on the inside. I would essentially be paying hundreds of dollars for the same tech only more storage. Since I am a reluctant buyer it was my wife who gave me the push by saying if you are going to be spending so much that I should get the model with the news tech. My only complaint is finding a good case for and iPad mini 4 is extremely difficult. I used to have a lifeproof on my mini2 and I miss it. Rated 5 out of 5 by SurfGirl from Just right I was concerned that the Mini would be too small to work on after using a regular for years. I was wrong. It's exactly the size and weight that I need, so I use it much more than I ever used the bigger one. Rated 5 out of 5 by Steven from Why did I wait so long? I had a Kindle that I was given as a gift 6 years ago, which I have used extensively. However, after buying my wife a Kindle with backlighting I have been wanting to upgrade my own unit. I finally decided that rather than just buying a new Kindle, I would get an iPad which would allow me to both use it for reading but also use it for web access while reading or traveling. This new iPad is outstanding. The Kindle app works great, as do all the others. If I need to access the web while traveling, I use the Personal Hotspot feature on my phone. Rated 5 out of 5 by Elizabeth from Great tablet Use it all the time. Had a hard time deciding between full size Air2 and this Mini 4. Chose the Mini 4 and it is just right. Not too big and way easier to read than iPhone 6. I do email on it and search internet with it. Have also read several books using Kindle app. Like looking at pictures on it. Love it for all. Got the Apple Smart Cover and the case for back. Expensive but so very nice - minimal size and weight change with these; definitely worth it. Additionally added Zagg HD Glass. Rated 5 out of 5 by taxtermite from Best tablet ever..... Photos and Videos, excellent resolution. The only downside is price, but hey you get what you pay for. Hi, Is this brand new or refurbished? The iPad is brand new in the box. We ship Apple products within the United States. how can i order thsApple 128GB iPad mini 4 with a Israeli power adapter? No, I am sorry but the Apple 128GB iPad mini 4 (Wi-Fi Only, Gold) B&amp;H # APIPM4W128G only comes with the US power adapter. You may however purchase an adapter from US to Israel. For apple 128 GB iPad mini 4 wi-fi only, Can I connect/install a external DVD player for watching DVD's? Will all DVD players work? Is the Ipad brand new or is it the refurbished one? The iPad is brand new, factory sealed with the full manufacturer warranty. Does it come with ios10? Pretty sure it doesn't. I bought it about a year ago. I'm using iOS 10 on it, however. You just need to update it and you'll be good to go! Asked by: Carole Lange E.